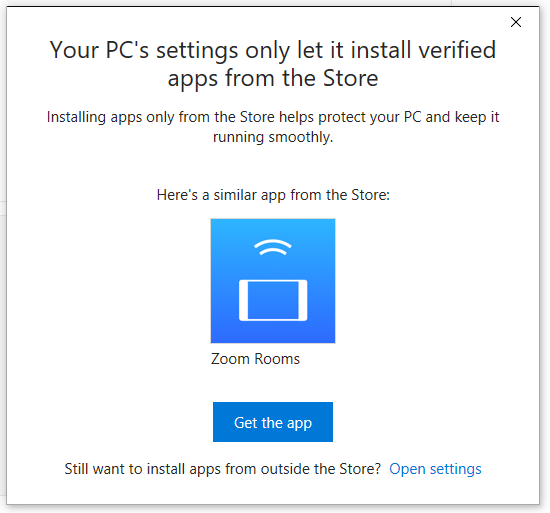 SecureVideo - Windows: "Your PC Settings only let you install verified apps from the store"
This is caused by a setting within Windows that prevents non-Windows apps from being allowed to install. To be sure you install the correct app instead of the alternative they suggested, please see the instructions below. 1. Click on the "Open Settings" link at the bottom of the message. 3. The setting will automatically save when selected. Close this window and double-click on the installation file to re-run. This article was last reviewed by our Support team on September 21, 2018.